For those who consider The Winter's Tale unfocused and unwieldy in its structure, I say, look around you. The Winter's Tale is a play about life written like life, with simultaneous and juxtaposed highs and lows, fear and hope, comedy and tragedy. For those who say the plot is too fantastical, I say, where have you been lately? Locker Room Talk and Sexual Assault: To Whom Should I Complain? 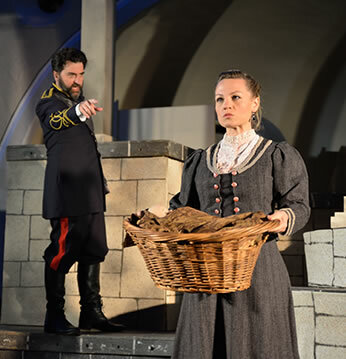 Leontes (Patrick Vest, left), countermands Paulina (Bridgid M. Rose) carrying his newborn daughter in the Shakespeare by the Sea production of William Shakespeare's The Winter's Tale. Photo by Nenad Bozin, Shakespeare by the Sea. Friends and families gather around food-laden picnic tables. Some people sit on blankets spread out on the grass, others recline in lawn chairs. Laughing children clamber among giant surface roots of humungous fig trees or run around palm trees. A couple of children run around selling programs, one dressed as a bear. "How ya been?" and "Kids doin' well?" float through the air, hugs flow through the bodies. Performers building their stage in an early 1900s band shell mingle with their audience like old friends. Looking in one direction, we see people carrying blankets, hauling coolers, and pulling wagons emerge from a parking lot and neighborhood streets. Turning to the opposite direction we see a sailboat gliding over the Pacific Ocean, which looks like a sheet of glass shimmering in the early evening sun. Below us, though, the tide crashes into boulders at the foot of precipitous cliffs. An 1874 lighthouse facing the sea used to warn ships away from this magnificent coastline; signs facing inland now warn pedestrians away from this magnificent coastline, one sign bearing the National Suicide Hotline's phone number. This is such a perfect convergence of place and purpose. We're at Point Fermin Park in San Pedro, California, to see Shakespeare by the Sea's production of William Shakespeare's The Winter's Tale. Amid the reunions of family and friends awash in a festival atmosphere between the city and the sea that giveth and taketh at the same time, we watch Shakespeare's play about all of the above. This could be one of those annual seasonal tourist-attraction fixtures: Cherokee, North Carolina, has Unto These Hills, San Pedro, California, has The Winter's Tale. No. This Winter's Tale is paired in a repertory with Shakespeare's The Merry Wives of Windsor touring to 23 parks around Los Angeles County. 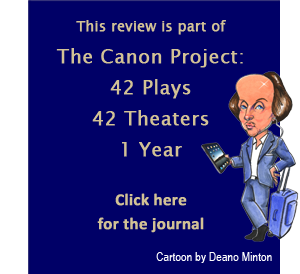 Founded by Producing Artistic Director Lisa Coffi, Shakespeare By the Sea has been doing this for 21 summers now, staging different plays each year. I just happen to be seeing the right play at the right place. For those who consider The Winter's Tale unfocused and unwieldy in its structure, I say, look around you. The Winter's Tale is a play about life written like life, with simultaneous and juxtaposed highs and lows, fear and hope, comedy and tragedy. For those who say the plot is too fantastical, I say, where have you been lately? Leontes, the king of Sicily, on the scantest of evidence imagines that his pregnant wife, Hermione, is having an affair with his best friend, Polixenes, the king of Bohemia. Polixenes escapes Leontes' assassination attempt, but Leontes imprisons Hermione and orders that her just-birthed daughter, whom he contends without evidence to be Polixenes', be discarded in a faraway wilderness. What pathological disease has taken hold of Leontes? Ego and insecurity. "He who shall speak for her is afar off guilty but that he speaks," he tells his court, seeing conspiracy in anything that contradicts him. "Our prerogative calls not your counsels," he tells anyone who tries to point out his mistake. He even dismisses the oracle of Apollo (i.e., the word of a god), despite an established record of its authenticity: "There is no truth at all i'th' oracle," he proclaims. "This is FAKE NEWS." Well, actually he says "This is mere falsehood," but my point is that in addition to the perfect place, I'm watching this play at the most pertinent time (the Edwardian-costumed production in no way identifies any current headliner: Shakespeare did that all on his own). Immediately upon angering the god, Leontes is knocked down with double tragedy: both Hermione and their son, Mamillius, die. As Leontes becomes deeply repentant, Shakespeare shifts the plot to Bohemia where the servant charged with disposing of the princess, whom he names Perdita, is eaten by a bear and his ship wrecked in a storm. Found by shepherds, Perdita grows up (the character of Time flies us through her childhood—how like time to do that) and becomes the love interest of Florizel, son of Polixenes. Bohemia, like Point Fermin, is full of festivity, but it gives way to more tyranny, from Polixenes this time, before everybody returns to Sicily for a happy ending—except, of course, for those who perished in the wake of Leontes' delusions. The play's climax has a statue (or not) of Hermione magically coming to life; what is that but the dream of every person who has loved and lost? "It is required that you do awake your faith," Paulina says as she orchestrates the moment. It helps to have a Paulina (Bridgid M. Rose) and a company of actors who can do just that, awake our faith with pitch-perfect performances (in a play that pitches back and forth like a gale-rocking ship) and solid ensemble work under the direction of Stephanie Coltrin. 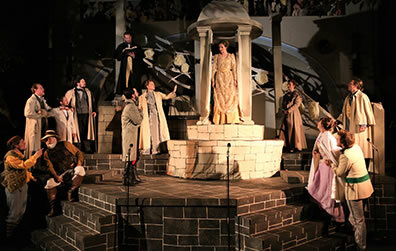 This is a company of professional actors that, for every performance, builds and strikes Scenic Designer Aaron Jackson's set of gray stone steps leading to a white temple-like structure, a cupola in the center, pillars at the back, and two broken pillars at the front. Jeffrey Schoenberg costumes Polixenes in red military uniform with a gold leaf sash and Leontes in a blue uniform with a black scroll sash. The Sicilian court wears tones of blue and gray, Bohemia's wears gold and beige, and the peasants at the sheepshearing feast wear every tone and fabric of the rural Bohemian landscape. Stage microphones placed within the set provide adequate acoustic coverage, and the sound mix delivers clarity in the dialogue (credit Sound Engineer Cintha Nava-Palmer). The effectiveness of this play pivots on Leontes' sudden, out-of-nowhere attack of jealousy in the opening moments, which comes with the half-line aside "Too hot! Too hot!" How directors predicate this moment usually hinges on how much trust they put in Shakespeare's theatrical sensibilities and experience by the time he wrote The Winter's Tale near the end of his career. Those who don't trust Shakespeare tend to make Hermione overly flirtatious or, perhaps, guilty as charged. Coltrin and her Leontes, Patrick Vest, not only trust Shakespeare but see the "Too hot!" moment's predication in Leontes' behavior, not Hermione's. Vest, staying true to the text, shows Leontes to be a little bothered by Polixenes (B.J. Allman) refusing to extend his visit to Sicily; somewhat vexed that Hermione (Leah Dalrymple) could convince Polixenes to stay when he couldn't (though Leontes asks her to); and increasingly irritated that his wife isn't reading his mind when he tells her, "thou never spokest to better purpose. … Never but once." Whether in answering him she's kidding with Leontes or truly doesn't think of her accepting his marriage proposal as the other "better purpose" matters not in the mire of a man's already-growing insecurities. Dalrymple plays this scene with opaque coyness, but the way she gazes on Leontes indicates that her coyness comes with confidence that her psychic relationship with her husband is solid. Vest's Leontes, though, needs unbridled assurance, not teasing. He seems to get that when Hermione takes his hand as she says, "Why, lo you now, I have spoke to the purpose twice: The one for ever earn'd a royal husband"—she lets go of his hand, turns, steps toward Polixenes and takes his hand—"The other for some while a friend," and Polixenes kisses her on the check. Hermione is putting on a show of graciousness celebrating the two men's friendship, but Leontes has steered his imagination into seeing infidelity in the gesture. When Vest speaks the line, "Too hot! too hot!" he clutches his chest and abdomen, as if suffering serious heartburn, and the words vomit forth. In an interview, Vest told me he had once experienced just such a moment, when a hurtful truth blew through him, and in his delivery of this line he is physically replicating the nausea he felt then. It demonstrates how deeply Leontes' truth is lodged in his very being. As the plot plays out, we experience the tragedy from two angles: what he's doing to himself and what he's doing to everybody else. Vest deftly uses similarly intense physicality to reach the emotional core of every turn in Leontes' journey. At the too-late moment of realizing his mistake, Vest goes beyond sorrow to absolute terror, staring in wide-eyed horror at the vacuum he has created in his life and soul. Having lived through such terror, he, in his Act Five interactions with Paulina, comes off as earnest, not maudlin or piteous. During the climactic finale, Vest's Leontes vibrates with such emotion melding loss and hope that he yearns to hold the statue of Hermione. Nor does the pain he suffered at his own hands ever go away. "Both your pardons, that e'er I put between your holy looks my ill suspicion," he says, taking both Hermione's and Polixenes' hands and then kneeling. Polixenes lifts him up, and while Leontes is grateful for the forgiveness, his eyes bear the loss of his son and 16 years' estrangement from his wife and friend. Dalrymple's portrayal of Hermione walks a tight rope through multiple dimensions: grace, playfulness, physical frailty after childbirth, moral strength, royal fire, personal resolve, public reserve. Seeing this production on two different nights, I noted two different readings of one single line: "I never wish'd to see you sorry; now I trust I shall." Shall what? Dalrymple's Hermione aches for Leontes, but while "I trust I shall" seems pointed at "see you sorry" on one night, an edge in her voice in the subsequent performance suggests "I trust I shall" is pointed at "I never wish'd." It may not be an either/or, something Dalrymple captures in playing the conflicting feelings Hermione now has toward her "royal husband." Starting his career with Katherine the shrew and Henry VI's Queen Margaret, Shakespeare finishes off his canon-spanning yield of powerful women with Paulina the shrewd and Henry VIII's Queen Katherine. Many productions wield Paulina like Thor's hammer. In this production, Rose's portrayal of Paulina is as much a psychological revelation as it is a commanding presence. She's smart and clear-eyed. "Here's such ado to make no stain a stain as passes coloring," she says of Leontes and his accusation of Hermione's infidelity. Her idea of presenting his baby girl to the king, and pointing out the likeness in their faces, makes sense. Leontes, though, can't see sense, and her act blows up on her as her husband, Antigonus (Chris Nelson), is charged with disposing of the baby in a distant wilderness. Harboring no faith in anybody in the court, Paulina grasps Apollo's oracle, and when Leontes countermands it and Hermione faints, Paulina immediately envisions the play's ending. Rose therefore delivers Paulina's great "Woe the while" speech not with histrionic passion or sledgehammer aggression but with rhetorical precision, building block by block to the announcement that Hermione has died. She's not aware that Leontes has repented in the short time she was offstage, but no matter: the rhetorical structure of her speech forces Leontes to relive every gut-twisting step of his expanding stupidity. A lord chastises Paulina for her boldness of speech, but it is the terrified look Vest gives her that actually cools her rage; she already knows she has to keep him alive and mentally stable, and their relationship in the play's second half displays genuine, mutual empathy. When the grown-up Perdita arrives in Sicily, Paulina immediately recognizes her and knows the oracle has come to fruition. She doesn't speak it now, of course, but her face tells all as all her emotions gush to her eyes. creating real tears that stream down her cheeks and off her chin. From first to last, front of stage to back, Rose turns in a stunning performance. Despite such emotion playing in the eyes of her actors, Coltrin still feels the need to bring the thunder, literally. A rumble sounds on a dozen key lines through the play's first half, from Leontes' "Too hot! Too hot!" through his orders to murder Polixenes, arrest Hermione, and dispense with the baby to news of Mamillius' death and the queen's. The thunder builds as Antigonus reaches Bohemia's coast—now a real storm, not just allegorical—and segues into the sound of a bear's roar. It's the roaring, not an actual bear, that pursues Antigonus off the stage. This production's only visual bear is a plush toy Mamillius receives in the opening scene and later is placed on his tomb. Allie Pratt gives a bittersweet performance as Mamillius, innocently happy as he implores his father to play, but shirking from Leontes' troubled meditations, especially when Dad too aggressively seeks his own DNA in his son's face. Pratt doubles as Perdita, and though a shepherd's adopted daughter, she displays a haughty attitude mingling with her charm: it's the DNA. Right, Polixenes (B.J. 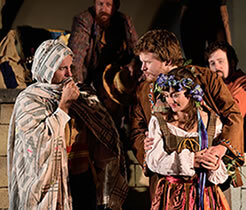 Allman) in disguise talks with his son, Florizel (Jonathan Cates) holding Perdita (Allie Pratt) as Autolucus (Cylan Brown) and a shepherd (Sean Spencer) watch in Shakespeare by the Sea's The WInter's Tale. Photo by Photo by Nenad Bozin, Shakespeare by the Sea. Below, the statue of Hermione (Leah Dalrymple, center) comes to life. Photo by Mickey Elliot, Shakespeare by the Sea. The production's starkest juxtaposition of tragedy and comedy—overlaying the two, in fact—comes with the Old Shepherd (Tom Killam) finding the abandoned baby, and his son, the Clown (Jonathan Fisher), running in to report on the simultaneous shipwreck and bear attack. The Clown describes Antigonus crying for help, identifying himself as a nobleman, and "how the poor gentleman roared," Fisher embellishes the text with Antigonus crying, "This is what I get for going bear hunting with my daddy," and roaring, "I thought I was on top of the food chain; I was wrong, so wrong." Just like that, even in the moment the bear is reportedly tearing out Antigonus' shoulder bone, we're into a romping rom-com. The thieving rogue Autolycus (Cylan Brown) steals the Clown's purse and then the vest right off his back. Florizel (Jonathan Cates) courts Perdita with electric fervor, a portrayal in which Cates successfully wins over the most demanding of critics, Rose's Paulina, who nods approvingly as she watches him interact with Perdita in Sicily. During the sheepshearing feast, two shepherdesses battle for the Clown's affections, Mopsa (Olivia Schlueter-Corey) and Dorcas played by Dalrymple, whom we last saw as a grieving, ailing queen and will next see playing a statue for 83 lines. Comic embellishments continue right into that climactic statue scene: When Paulina instructs "those that think it is unlawful business I am about, let them depart," the Old Shepherd, Clown, and Autolycus begin walking up the aisle, but they stop on Leontes' command to "Proceed: No foot shall stir" and reluctantly return to the stage. Another bit of comic stage business has Florizel start to walk offstage left when Camillo (Greg Prusiewicz) instructs him to take ship. In a subsequent scene, The Old Shepherd and Clown also move stage left when Autolycus tells them to take ship. Wrong direction. "City there, sea there," both Camillo and Autolycus point out, an obvious truth here in Point Fermin Park. Despite the commercial establishments neighboring the park, the only ambient intrusion we experience are a pack of motorcyclists and a heightening fray involving at least one woman at one end of the park (I don't think she was a Bohemian shepherdesses). On the sea side, a helicopter passes low just off the coast shining a spotlight into the surf, which is both an aural and a psychological intrusion: We're watching The Winter's Tale while, in real life, someone has gone missing.